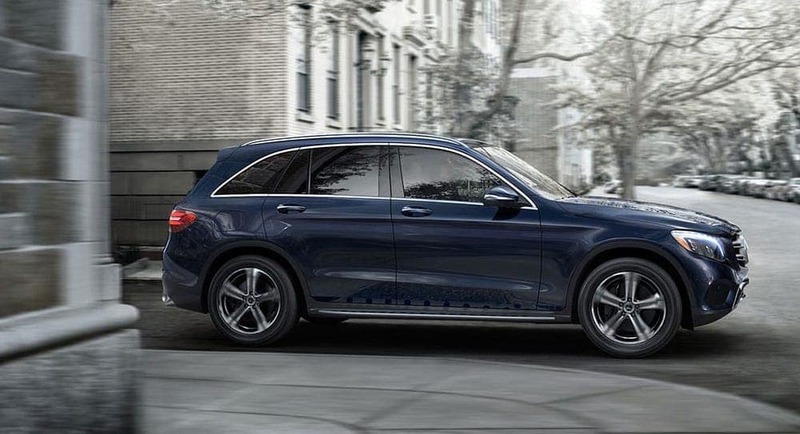 For Decatur area drivers searching for a versatile luxury SUV, the 2019 Mercedes-Benz GLC is a a great choice. No matter which one of the five available GLC SUV trim levels you choose, you can enjoy a wide array of premium features and superior performance capabilities. Review each GLC configuration and MSRP, from the GLC 300 to the AMG® GLC options, then contact Sullivan•Parkhill Automotive Inc to schedule a test drive. GLC 300 SUV: This entry level model comes with an MSRP starting at $40,700 and is powered by a 2.0L inline-4 turbo engine that delivers 241 hp and 273 lb-ft of torque. Standard features include a FrontBass® audio system, a power liftgate, and a 14-way power driver seat with memory. GLC 300 4MATIC® SUV: With a starting MSRP of $42,700, this model comes with the superior Mercedes-Benz 4MATIC® all-wheel drive system, in addition to standard features such as ATTENTION ASSIST®, Active Brake Assist, and ECO-START®. GLC 350e 4MATIC SUV: Starting at $49,990 MSRP, this fuel-efficient SUV is powered by a 2.0L inline-4 turbo engine paired with a plug-in hybrid electric motor. The hybrid powertrain delivers an impressive 315 hp and 413 lb-ft of torque. GLC AMG® GLC 43 SUV: Starting with an MSRP of $56,250, this GLC SUV features an AMG®-enhanced 3.0L V6 biturbo that produces 362 hp and 384 lb-ft of torque, and can race from 0 to 60 mph in 4.8 seconds. GLC AMG® GLC 63 SUV: This model has a starting MSRP of $69,900 and features a handcrafted AMG® 4.0L V8 biturbo engine that generates a breathtaking 503 hp with 516 lb-ft of torque. The AMG® GLC 63 can go from 0 to 60 mph in a mere 3.8 seconds. GLC 300 4MATIC® Coupe: With a starting MSRP of $47,300, the Mercedes-Benz GLC 300 Coupe comes with a 4MATIC® all-wheel drive, ECO-START®, ATTENTION ASSIST®, and more. AMG® GLC 43 Coupe: This AMG® model has an MSRP that starts at $60,400 and comes with additional standard features such as heated seats and HD Radio®. AMG® GLC 63 Coupe: Starting with an MSRP of $73,150, this exquisite coupe is powered by an AMG® 4.0L V8 biturbo engine that produces 469 hp and 479 lb-ft of torque. AMG® GLC 63 S Coupe: The top-of-the-line model comes with a starting MSRP of $74,150 and includes a Burmester Surround Sound System, Mercedes-Benz PRESAFE®, and many more premium features to enhance your Danville area commute. Explore our Mercedes-Benz GLC inventory to find the model and configuration that best suits your needs, then visit our Mercedes-Benz showroom near Mattoon to learn more about all that a new GLC SUV has to offer you today. Check out our new vehicle specials and use our convenient payment calculator to find out what your monthly payments will be.